Epimetheus - Universe Galaxies And Stars Section. Saturn with Epimetheus. Image credit: NASA/JPL/SSI. Look at this photograph very carefully. Just below Saturn's rings, to the left of the bright side of the planet is its tiny Moon Epimetheus (116 km or 72 miles across). This Moon hugs the outside edge of Saturn's F ring, beyond the orbit of Pandora. Cassini took this photograph on June 9, when it was approximately 4 million kilometers (2.5 million miles) from Epimetheus. Cassini captured this arresting view of Saturn just before Epimetheus crossed into the blinding glare of the planet's sunlit crescent and was lost. As it orbits Saturn, Epimetheus (116 kilometers, or 72 miles across) hugs the outside edge of the narrow F ring, beyond the orbit of Pandora. The F ring is the brightest ring feature seen here. Saturn's southern hemisphere is softly lit by sunlight reflected off the rings. 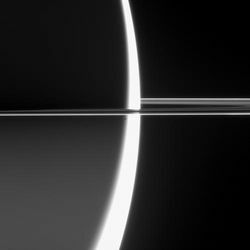 A less obvious feature in this view is the planet's shadow, which begins to darken the inner regions of the rings at left. The image was taken in visible light with the Cassini spacecraft narrow-angle camera on June 9, 2006 at a distance of approximately 4 million kilometers (2.5 million miles) from Epimetheus and 4.1 million kilometers (2.5 million miles) from Saturn. The Sun-Epimetheus-spacecraft, or phase, angle is 161 degrees. Image scale is 25 kilometers (16 miles) per pixel on Saturn.